Today everything aligned perfectly — time, equipment, and perseverance — and I was able to test the new Work Visual app by Holger Nils Pohl. I am SO excited! These are some initial notes about my experience. Visual notes of Tom Wujec’s TED talk, Wicked Problems, made during a trial of the beta version of the Work Visual app. LOVE IT: What I already adore about the app! I love the clean interface and the ease of switching layers and brushes. I love that I can customize four brushes and they are right on the toolbar. I love the zoom in (but not the zoom out, see below). I love the line quality, which for me is one of the most critical components. Nailed it! WISHES: What I would wish to see in future versions. Double-tap to zoom out. If there is a quick way to zoom back to full screen, I never found it. This is what gave me the most trouble during my practice run. I don’t know if it was the iPad I was using (I had to borrow one*), but the panning kept sticking while I was zoomed in. I’d start dragging with two fingers, and sometimes nothing would happen. This slowed me down a lot too. There’s a strange thing that happens when one line crosses another, like when I’m lettering. At first I was disturbed by it, but then I realized that it wasn’t permanent and I was able to ignore it. What happens is that the color gets shifted around the crossed lines (on the left), but once you zoom or pan, it goes back to normal (on the right). (Left) Color shifting when lines cross; (right) back to normal after zooming. I wasn’t able to test the projection capabilities today, but I am super excited about them because it means you can FINALLY do graphic recording on the iPad while hooked up to a projector and not have to distribute airsickness bags to the audience beforehand. You can set it to only show the full screen, no matter how much you’re zooming and panning. Hurray! I also couldn’t test the video export but I hope to be able to once it’s ready. I am so looking forward to the release of this app! Want to follow along while Holger develops it? * Why I couldn’t use my own iPad: I’m still using the original Brushes app to create videos. Unfortunately, the export features of the original Brushes don’t work with the newest iOS. Also unfortunately (for me), TestFlight, which you need in order to test Work Visual, doesn’t work with older versions of iOS. So Brushes and the Work Visual beta cannot coexist on my iPad. Posted in everything. Tagged with graphicrecording, ipad, reviews, sketchnotes, tablet, tools. My colleague and friend Lisa Arora of Get the Picture recently published two digital books about important topics in graphic recording — how to really make the most of the dance between a facilitator and a graphic recorder, and how to conduct gallery walks of completed charts — and they are outstanding. How To Get the Most Out of Working with a Graphic Recorder is an excellent resource for facilitators and graphic recorders (GRs) about how to work together. The suggestions and explanations are clear and insightful, and if you implement them I guarantee they will make your very next tandem engagement better. I highly recommend it for anyone running a meeting or workshop who plans to work with a GR, even if you don’t think of yourself as a facilitator. If you’re wondering whether you want to hire a graphic recorder and have never engaged one before, read this book to understand how to work with one so that you reap the real value of working visually. If you tend to work solo (doing both the facilitation and recording yourself), you might pick up a few tips, but the book is really aimed at facilitator-graphic recorder partners, and for those who plan to engage one or the other. 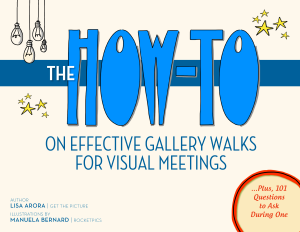 The other book, The How To on Effective Gallery Walks for Visual Meetings, is comprehensive, creative, and brilliant. It really gets into gallery walks (where participants spend reflective time looking at the maps at different points in the meeting, and thinking deeply about them). It goes way beyond grouping people up and having them file past the charts. If you want to extend the life of the maps, maximize their usefulness to participants, and deepen the level of thinking in the group, get this book, read it, and build a real gallery walk into your next visual meeting. I’ll be pulling ideas out of this one starting immediately, I can tell you. Go take a look at the two books. If you partner or hire facilitator/GR partners, get them both. If you are a graphic recorder, a facilitator, or a dual-role graphic facilitator, or if you plan, host, or sponsor visual meetings, get the one on gallery walks. You’ll be glad you did. Posted in everything. 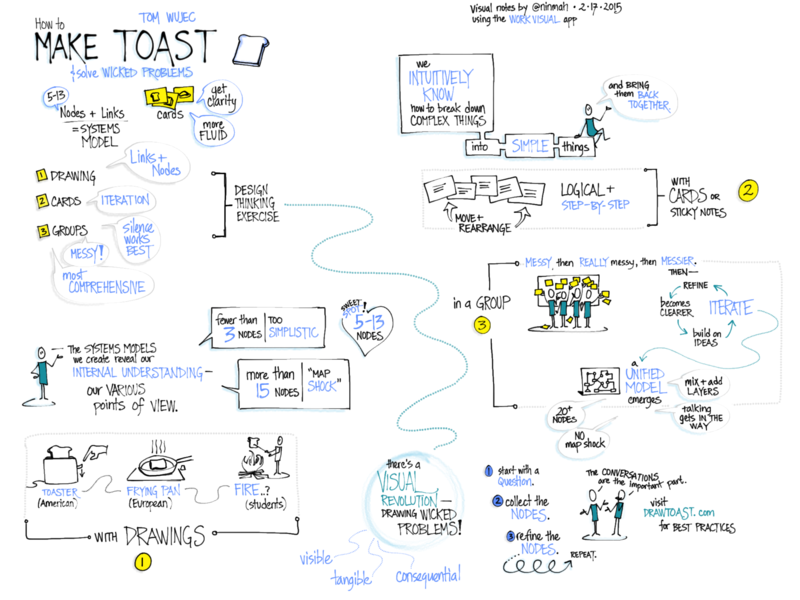 Tagged with graphicrecording, howto, reviews, visualpractice.